Robust construction using 2mm and 3mm steel. Fully welded sump to comply with COSHH regulations and prevent leaks. Highly secure with a keyed-alike 5-lever deadlock, welded ID numbers and 6mm reinforcement around lock. Strong gas struts and safety catch fitted as standard- conforming to industry standards and allowing ease of access. Featuring both high and low ventilation, to prevent build-up of fumes. Fork skids with fixing slots for easily adding castors, allowing heavy duty storage. Ideal for use on construction sites and in factories. 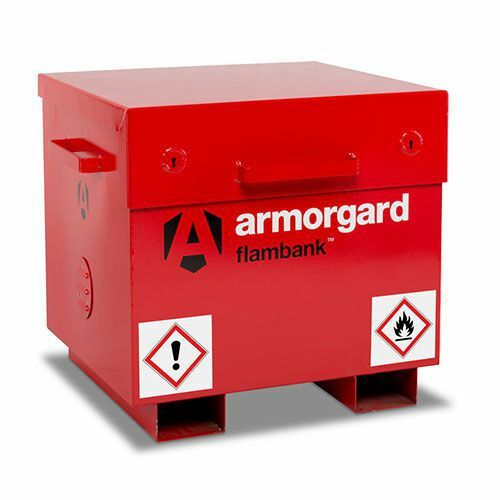 Resilient lockable vault for storing hazardous chemicals and flammables.